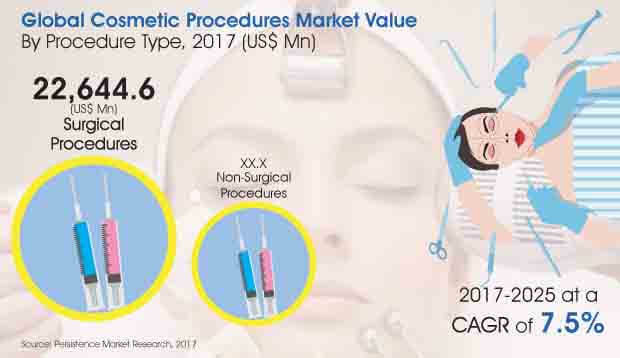 According to Persistence Market Research, the global cosmetic procedures market is anticipated to witness significant market valuation and a robust growth rate during the period of assessment 2017-2025. The cosmetic procedures market has seen positive growth trend since 2012. In 2016, the global cosmetic procedures market was valued at US$ 27 Bn in 2016 and is estimated to reach US$ 51.6 Bn by the end of 2025. The global market is poised to grow at a robust rate to register a CAGR of 7.5% throughout the period of forecast. This growth is pushed by the rising trend of medical tourism, higher adoption of cosmetic procedures especially in the emerging economies and rising prevalence of skin disorders that offer lucrative opportunities to adopt various laser surgical treatments. Moreover, innovations in the medical field are growing, new technological developments have changed the face of the industry, with more people relying on advanced procedures to treat disorders. This has accelerated the image of various cosmetic procedures in the minds of people which in turn has driven the growth of the global cosmetic procedures market. Non-surgical procedures segment by procedure type is expected to grow at the highest growth rate during the assessment period. Non-surgical procedures are being extensively used and by the end of the forecast period this segment is supposed to witness a 2x growth in revenue to reach a market valuation of about US$ 12.9 Bn by 2025 end. This segment is poised to grow at a high CAGR of 9.5% throughout the forecast period to reflect these statistics. The surgical procedures segment is the largest segment by procedure type, as it shows a high market value. This segment lead the global cosmetic procedure market by procedure type in 2016 and the trend is more likely to continue during the forecast period. The surgical procedure segment is sub-segmented by face surgeries, body and extremities and breast surgery. Of these, the face surgery sub-segment is expected to grow at a meteoric rate to register a high 9.1% CAGR during the forecast period. Blepharoplasty and Rhinoplasty are major contributors which push the growth of the face surgeries sub-segment. With respect to market value, following face surgeries sub-segment, breast surgery shows an upper hand but is expected to grow at a slow rate during the 2017-2025 period. The body and extremities sub-segment is poised to grow at a 7.1% CAGR during the period of assessment. Face surgeries and breast surgery sub-segments are the largest contributors for the surgical procedures to lead the global market in terms of value in the coming years. Non-surgical procedures is further classified into injectables, facial rejuvenation and others sub segments. The injectables sub-segment is expected to show high growth and market value by the end of 2025. This sub-segment is poised to register a CAGR of 10.2% throughout the period of forecast due to its wide acceptance and application. This sub-segment is a major contributor of growth for the non-surgical procedures segment followed by facial rejuvenation sub-segment which is poised to grow at a CAGR of 8.7% in the 2017-2025 period.